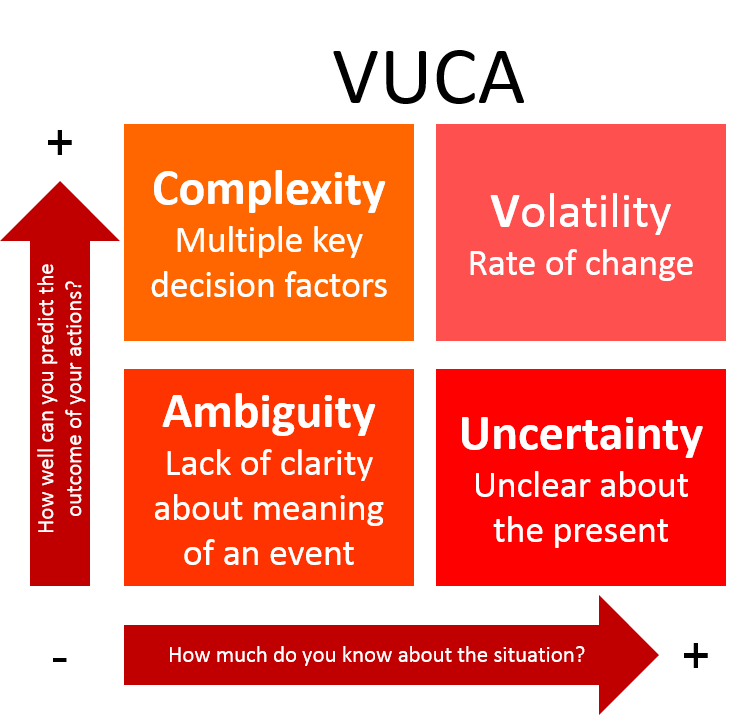 VUCA is an acronym that stands for volatility, uncertainty, complexity and ambiguity, a combination of qualities that, taken together, characterize the nature of some difficult conditions and situations. The term is also sometimes said to stand for the adjectives: volatile, uncertain, complex and ambiguous. The term VUCA originated with the United States Army War College to describe conditions resulting from the Cold War. The VUCA concept has since been adopted throughout businesses and organizations in many industries and sectors to guide leadership and strategy planning. An awareness of the forces represented in the VUCA model and strategies to mitigate the harm they might cause are integral to crisis management and disaster recovery planning. Volatility refers to the propensity for changing from one state to another. Under certain conditions, volatile materials can dangerously explode, changing rapidly from stable to disordered. This provides another implication that volatile conditions are dangerous conditions. Another example of volatility is found in financial markets, and it the concept of volatility expresses the rate and amount of change from buying to selling and the changing interest (in terms of numbers of contracts/shares) in any given market. The interesting thing about volatility is that even though it might represent danger, it can also represent opportunity. Let’s return to the financial market situation: many market traders make excellent money by trading on volatility (making an informed bet on the movement of a financial instrument) such as trading options on a company that is making a scheduled earnings announcement. The point is this: volatility is a good if you are seeking opportunities and bad if you like predictability. Uncertainty refers to the lack of specific information, which can be found by answering specific questions. Asking “What is the probability that it will rain today?” is a question that is an attempt to characterize uncertainty. Complexity refers to the number of components, the relationships between the components. The normal layperson’s usage of the complexity tends to oversimplify the scope of practical problems facing leaders in organizations. Complexity differs from “complicated.” A complicated issue can be understood by analysis and investigation beforehand. The Latin prefix “ambi-“refers to multiple or non-fixed, such as its use in the words ambiance and ambidextrous. Ambiguous language is language that can be interpreted differently. Ambiguity is a cause of stress for many people (especially those who work in well-structured organizations) as the disorder implied by ambiguity is not comfortable. People tend to avoid, ignore, or minimize ambiguity. VUCA is a condition that calls for questions — lots of them. Penetrating questions that ferret out nuance. Challenging questions that stimulate differing views and debate. Open-ended questions that fuel imagination. Analytical questions that distinguish what you think from what you know. The only thing you know with certainty about your strategy is that it’s wrong. Persistent probing will help you discern if it’s off by 5 percent or 95 percent before events swiftly reveal the answer to you. Agility is critical because strategic adjustments must be made continually. Get curious and prosper in the VUCA world! Previous PostPrevious How to revise the Code of Conduct of an organization? Next PostNext How should insurance companies manage their risks?